A new species and genus (Cecidonius pampeanus) of primitive monotrysian micromoth from the Brazilian Pampa biome has been recently discovered to induce scarcely noticeable galls under the swollen stems of the Uruguayan pepper tree. Gall-inducing moths lay their eggs in the tree bark, where the larvae form the characteristic roundish swellings as they grow larger. In their turn, these galls attract various parasitoids and inquiline wasps – wasps that have lost the ability to form galls for their own eggs – and so they take advantage of the galls of other species, while under development. The inquilines modify the galls into larger ones which subsequently last longer and attract even more attention. As a result, even though abundant as young, the new moth's larvae rarely survive and their density in the field later in life is low. While free-living gall moths are generally rare, the studied genus pupates on the ground, resulting in its being overlooked for over a century. Furthermore, the galls fall to the ground where the last instar larvae undergo a period of suspended development for months. They stay motionless within their gall until pupation and emerge as adults in the next growing season. After all this time, this species has finally been recognised in the open access journal ZooKeys by an international research team, led by Dr. Gilson Moreira, Universidade Federal do Rio Grande do Sul, Brazil. In their paper, the scientists describe the gall, immature stages and adults of the moth. They also provide information on its natural history in conjunction with one of the associated parasitoid and inquiline wasps. "It took several years to obtain a small number of C. pampeanus pupae and adults to use for the description," say the authors. "The existence of these galls has been known for more than a century. However, biologists believed they are induced by the inquiline wasps," they explain. "Consequently, it turned out that the wasps do not induce galls, but rather modify them early in development into large and colourful, visually appealing galls." The study also provides strong evidence that the species is under threat of extinction and the scientists suggest that protective measures need to be taken to conserve it. In fact, they found strikingly low levels of gene flow amongst populations of C. pampeanus. In their paper, the team also emphasises that, in case of extinction of the primary gall inducer, a whole insect community associated with their galls will follow. This could happen even before science becomes familiar with all of these species. Open savannahs of southern Brazil, where populations of the new moth's host plant (the Uruguayan pepper tree) are found, have been suffering from anthropic impact for decades, mostly caused by agriculture and cattle ranching. 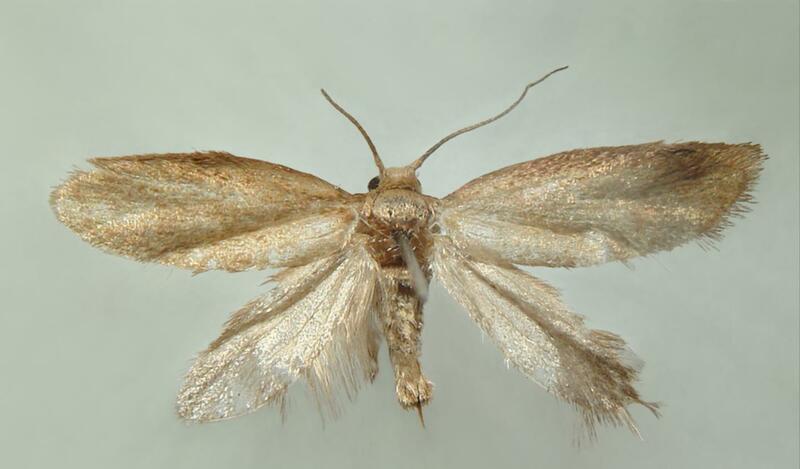 Curiously, the present study is the first in Brazil to suggest that a micromoth and its associated fauna should be subjected to conservation measures. Extant populations of the new species are distant and isolated from each other, being restricted to a small geographic area in the northeast Southern Brazilian "Campos" (= Pampean savannah), a neglected biome from a nature preservation perspective. Most of the moths have retreated to higher elevations, such as hilltops and hill slopes interspersed with small bushes, where they get shelter from the anthropic influence.